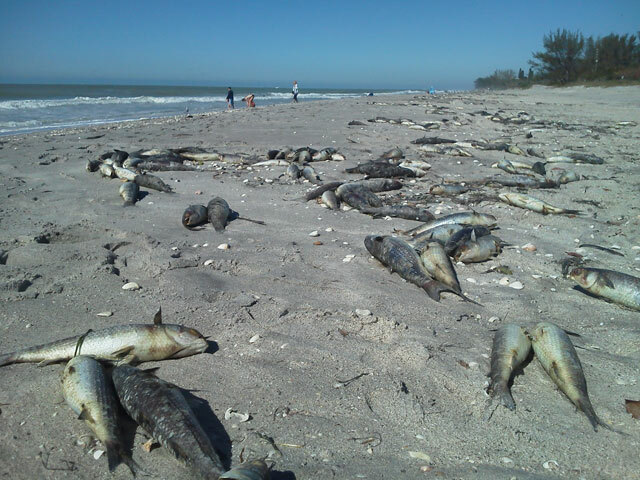 Thousands of dead fish are once again washing up along Suncoast beaches. The mass fish kills are being blamed on red tide, an algae bloom that causes reduced oxygen levels in area waters. "You have to watch where you step you might step on a cat fish," said Sarasota lifeguard Brad Ward. And, while the warning may sound bazaar, its actually real because as far south as Venice, throughout Sarasota and going north into Manatee County. Area beaches have been inundated with dead fish washing ashore. "It's just a microscopic algae bloom basically that causes the water to turn red. It's like basically taking the oxygen away from the fish," said Ward. Ward says they've posted signs all over area beaches in an effort to inform visitors about red tide and its impacts. Area health departments and Mote Marine scientists have also issued warnings saying the impact goes beyond the marine life. "Volunteers reporting what they see and hear have noticed dead fish as well as respiratory irritation which could be coughing or sneezing," said Hayley Rutger, Mote spokesperson. Rutger says those with respiratory illness should use extra caution. "With respiratory conditions such as COPD, asthma anything that's chronic and really effect you can be exasperated by red tide so you wanna pay attention to those forecast." But the impact isn't just affecting people with respiratory diseases. Beach goers like Holli Dupuis says she normally doesn't have breathing issues but after a few minutes at an area beach her and her husband's throat became irritated. "We went to Manatee Beach on Sunday and as soon as we put our chairs up, we were coughing and we could hear people around us coughing. I said to Bruce it sounds line a hospital ward with everyone coughing," added Dupuis. Officials say those who are sensitive to red tide impacts should avoid impacted areas. They also add red tide is constantly moving so you need to check the marine forecast before you head out.